As an amateur boxer, Guillermo Rigondeaux seemingly had everything. The totality of his record is unclear; some reports say he won close to 400 bouts and lost no more than 12, others that he in fact was victorious in 243 and defeated in just four. What is certain is that he secured Olympic gold at the Sydney Games in 2000 and again in Athens four years later. He claimed a pair of amateur world championships, and he was his country's national champion for seven straight years. That country, however, was Cuba. Cuba is renowned for its conveyor belt of amateur boxing talent, producing Olympic greats such as Joel Casamayor, Teofilo Stevenson and Felix Savon. Yet of them all, says HBO's Max Kellerman in 'Road to Donaire-Rigondeaux', a preview of the Cuban's Saturday bout with Nonito Donaire, "Rigondeaux is the one I was most excited about. He's the one I thought posed the most threat to the pros because he has superb defense and real punching power." Yet Rigondeaux lived in a country where there was no professional boxing, no opportunity to earn anything for his ability other than gold medals and the gratitude of his nation. So in 2007, he defected. Briefly. Maybe. In late July of that year, Rigondeaux and countryman Erislandy Lara disappeared prior to their scheduled bouts at the Pan-American Games in Rio de Janeiro; a couple of weeks later, they were found by Brazilian authorities, accused of overstaying their visas, and deported back to Cuba. Although they insisted they had not planned to stay in Brazil and had intended to go back to Cuba, they found on their return they had effectively been unpersoned. Now, even amateur boxing in the Cuban system was denied to them, and so in 2009, Rigondeaux defected again – this time definitively and successfully, taking to the water between Cuba and Florida, the state where he now makes his home. 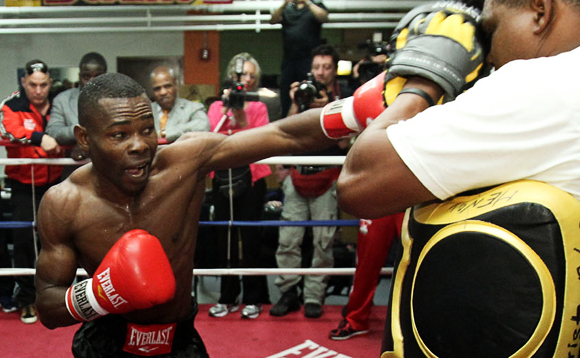 "It was a very complicated experience," admits the boxer on 'Road to Donaire-Rigondeaux.' "I had to leave my family in Cuba, not knowing when I'd see them again. But what's important is that I can help them from here. As long as they're safe, they'll be OK."
He turned professional in May 2009 against Juan Noriega; in just his ninth professional bout, in January last year, he won a super-bantamweight belt. At times, his fast-but-heavy hands and his wealth of amateur experience have combined to devastating effect, as in that title-winning effort against Rico Ramos, a sixth-round KO win; his first-round TKO victory over Willie Casey; or his stoppage win against Teon Kennedy in June. Occasionally, however, he has looked less than dominant: Ricardo Cordoba pushed him to a split decision at Cowboys Stadium in Dallas in 2010, and in his most recent outing, he was twice wobbled in an otherwise comfortable win over Roberto Marroquin. Some observers have suggested that the wobbles against Marroquin, combined with a knockdown he suffered against Cordoba, hint at a chin that may not be the strongest. If that is so, there can be little doubt it is a weakness that Donaire will seek to exploit. Rigondeaux, in turn, will look to counter Donaire as the Filipino-American attempts to press his perceived advantages. It is a style matchup that promises both an intriguing chess match and explosive exchanges with the possibility of an early ending for either man. Whatever happens in the ring, Rigondeaux knows that he has been knocked down before outside it, but risen to beat the count and keep on fighting. If he wins, he will have defeated one of the top pound-for-pound fighters in the world and will surely be considered to have achieved that level himself. But the very fact that he is at this point, taking on Donaire in New York on HBO, shows that he's already won his most important battle.